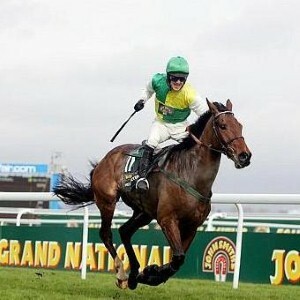 Having fallen at the last, while still in contention for the 2004 Martell Grand National, the 9 year old Trevor Hemmings owned Hedgehunter had been installed as the 7-1F for the 2005 running of this famous steeplechase. Also heavily backed were last year’s runner up Clan Royal, trained by Jonjo O’Neill, the Richard Ford trained Forest Gunner and French Grey, Strong Resolve. Last year’s winner, Amberleigh House was listed as 16-1, 5th favourite. The going for the rebranded John Smith’s Grand National was good to soft and the 40 strong field set off under leaden Aintree skies. The assembled crowd cheered as the race was officially underway. By the time the field crossed over Becher’s Brook for the first time, there had been just 4 fallers, with last year’s 3rd placed horse, Lord Atterbury, trained by M C Pipe amongst those whose race ended in the first few fences. The early running was being made by 150-1 outsider Glenelly Gale, followed a couple of lengths back by Double Honour with Paddy Brennan in the saddle and Astonville in 3rd. At the mid way point of the race, there were still as many as 20 horses within touch of the leading bunch and the arduous Aintree course had resulted in 8 fallers. The remaining field was still headed by Glenelly Gale, who was starting to feel the pace, causing the horse to fade away shortly after. Coming up to Becher’s Brook for the second time, Clan Royal, who had been flanked by two riderless horses for much of the straight was baulked by the pair, leading to a refusal and disappointment for Jockey Tony McCoy. This allowed favourite Ruby Walsh on Hedgehunter to hit the front, jumping over Foinavon, followed by Innox, ridden by Robert Thornton and 16-1 shot, Joly Bay in third.